Hitachi America has introduced its CP-WU8461 and CP-WU8451 LCD projectors, both of which offer HDBaseT Ultra HD video networking capability along with 60 percent improved contrast, WUXGA resolution and other enhancements. 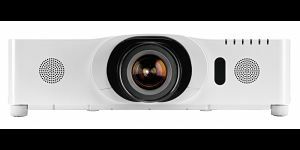 Designed for mid- and large-sized auditoriums, both models can deliver images in formats including Ultra HD/3D and 2K/4K video via the projectors’ Cat5e/6e input. The new projectors can receive video signals from distances of more than 300 feet via HDBaseT. Both also have a selection of A/V inputs including HDMI, component, S-Video and composite video, USB Type A and Type B, computer, and audio LAN. The CP-WU8461 and CP-WU8451 can be used for screen sizes up to 600 inches diagonal with WUXGA 1920 x 1200 resolution and output of 6000 and 5000 lumens, respectively. Both models provide motorized focus, zoom and lens shift, allowing users to adjust the image using the included remote control. In addition to the supplied 2.0x zoom lens, four optional additional lenses are available to accommodate a variety of projection distances. Picture By Picture and Picture In Picture modes.